I gathered together a few recipes form my blog in one place, which might make good Super Bowl Food offering. 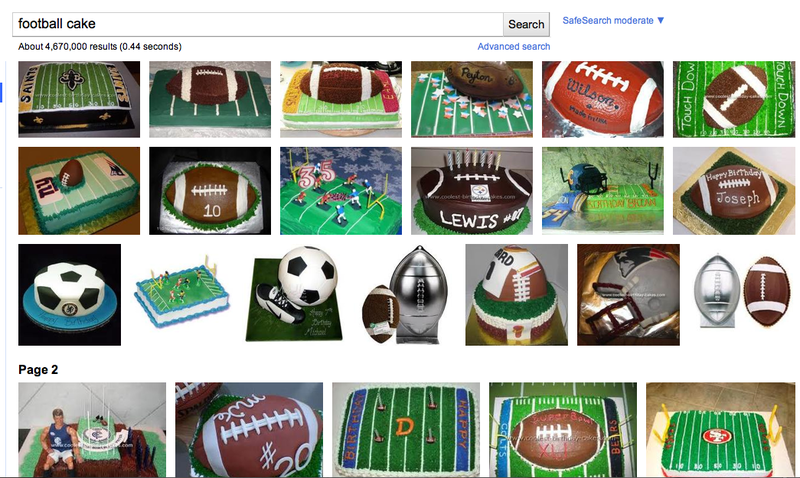 I also want to pass a link to epicurious.com who has a good post about planning a Super Bowl Party. There has been an ongoing debate on the Michigan Farmers Market Association Listserv about what type of vendor should be allowed at a Farmers Market. Among the issues discussed are whether to allow vendors from out of state and whether to allow resellers, people who do not grow their own produce/meat/cheese/artisan products etc. to sell at the market. I have provided a small sample of the responses to this passionate debate below. How do I weigh in on the subject? I have no problem with vendors coming in from bordering states. The Ohio border is closer for example than many towns in Michigan with farmers who might come to sell at an Ann Arbor Farmers Market. As some will know, I sell microgreens at the Westside Farmers Market. I grow them in a small backyard garden and I am pretty sure that the Westside only allows grower/producers to sell there. I like the policy. By contrast, I have been to markets with vendors who sold out of the region fruits like grapefruit at their booth. The fruit was no even organic, and I felt that it did not fit in at the market. What made the grapefruit at a farmers market any different from buy it at the grocery store? I felt if too many of the vendors were resellers it would make customers question the difference between a farmers market and the produce section of a chain grocery store. So where do I stand on the reseller question? Ideally, I think that a farmers market should strive to try to have only growers/producers. Customers who come to a farmers market assume that they are buying from the farmer and come to the market in part to by local. Buy locally and Meet Your Farmer/Artisan is a huge marketing slogan for Farmers Market and having too many resellers may weaken a Farmers Market Brand. It may be hard to find the variety of farmers and artisans to make a well rounded market with a grower/producer only policy, but I feel that sticking by that policy will support new upstart local growers (like myself) who will be vendors at your Farmers Market. Customers will appreciate it and the Market would have created a great Brand. Yes there is reason!! I live 2 miles from the INDIANA state line and in our market we have some growers that live on the other side of the line. Yes we do know they grow the produce but they are from out of the state making there produce from another state. My sister brings here sweet corn and that is 7 miles from our market in Indiana, what you are saying is we should cut our market in half because we should not have out of state produce. In the reverse I should not be able to sell in the markets in Indiana we sell in because we are out of the state? We feel that the local is within 50 miles but our venders are with in 30 miles. We understand local very well but every market is to understand the location of what you are talking before blanket NO reason to have produce coming from out of state. There is absolutely NO reason for markets to have any produce coming from out of state, much less out of the country!!!! I do feel that some reciprocity is helpful, however, among farmers with different types of produce, limited growing seasons, limited time to attend markets. Farmers markets are hard work, as we all know! As more communities have started small neighborhood markets it becomes impossible to attend so many of them, and this invites fraud/reselling/misrepresentation. Co-op selling is a good idea and helpful to all. I agree that the early and late season present “volume” issues for farmers, but there are a lot of ways to plan for that and they should plan accordingly with other offerings of their own or from local collaborators. Storage crops?????? BUT the key, as Chris says, is transparency. In my view the basics indicated by Chris are the sign of a healthy market of the type that the people really want, and anything else undermines the credibility of the entire system. I recently found garlic from China at one of the roadside produce stands–which the average person assumes means local produce, but of course we know differently…. The recent televised scandal in Oakland county, in which a grower represented his produce as “pesticide free”, sustainably grown, etc. but was filmed purchasing it at the Eastern Mkt. has sent shock waves through our farmers market and, more importantly, organic growers communities. ALL farmers are hurt by those who cut corners or misrepresent their produce !!!!!!!! Unless our markets represent local, fresh produce there is no reason for people to shop there when the grocery store may be cheaper or more convenient. HIGH STANDARDS, TRANSPARENCY are what I look for when I think about where I want to sell my produce and where I want to buy it! You have raised a CORE issue that troubles many farmers’ markets and their managers. farmers’ market. Many of this resellers simply double the wholesale price and sit there as if the produce was their own. Some farmers buy in the wholesale market for early and late in the season, selling their own produce during peak production periods. And there are many variations in between. So what should you do? I believe the key concept here is TRANSPARENCY. In my opinion, every vendor at a farmers’ market should be required to publicly display the following information. 1. Where the various fruits and vegetables were grown? Local? From some other place? 2. How were they grown? Were pesticides and herbicides used? If so, which ones? These three pieces of information make the reseller vs. grower controversy mute. Resellers simply label their produce as such. If their lettuce was harvested three weeks ago in Mexico, they should reveal this information. Transparency means everyone competes on a level playing field, building trust with customers and supporting ethical behavior in food production. Unfortunately, there is strong resistance to all three transparency requirements. I resigned from the Board of the Michigan Farmers Market Association over this issue. Right now, we, as a state, permit some vendors, often big anchor vendors at farmers’ markets, to blatantly misrepresent or hide this information. This is neither sustainable, ethical, nor economically smart. The local food revolution must be based on integrity and transparency. Let McDonalds call their McNuggets chicken even though half the ingredients are not chicken. With TRANSPARENCY and honest labeling, farmers are free to do anything they chose. And the consumers’ rights are protected in the process. We are facing a conflict at our farmers market between growers and resellers. Would like to know how people are dealing with this. More importantly, looking for research to either show that both can be or not be supported at one market. Thanks! To remove yourself from this list, email to: listserv@list.msu.edu and include the following in the text of the message: UNSUBSCRIBE FARMMKTMI. If this method does not work, then please email smalley3@msu.edu in order to be removed from the list. Just like when it was safe to go back into the water and eat fat again, today the announcement is that we can have our carbs and eat them too. Of course, we foodies already knew as much, that eating a balanced plate of food just seemed right. The standard carb, protein and veggies, which are artfully plated by our favorite chef has been the model for a satisfying meals. Now a new diet book says as much. According to the Skinny Carbs Diet: Carb Lover’s Diet Cookbook by David Feder RD, carbs should not be cut from meals. Resistant starch has fewer calories than regular starches but is more filling so dieters feel satisfied quicker. Bananas, corn , potatoes, yams, pasta, pearl Barley, whole grain bread, navy beans, oatmeal, lentils and brown rice are some of the common resistant starch foods. So have the hippy rice and bean eaters been right all along? I tend to think so. When the dust finally settles with America’s endless obsession of the diet of the month club, eventually I feel the winner of the diet wars will be a balanced plate that include carbs, fat, protein and fresh veggies and/or fruit. In other words, real food with a good balance. Until then, I say enjoy your carbs. Any olive lovin’ person knows about the pits. Freshly pitted olives are worth the effort because they usually have more flavor. Of course the challenge is making sure you pit them all to prevent a pit from ending up in your food. I know I forget a pit or two. Luckily, I have not have bitten down so hard on a missed olive pit to screw up my teeth. Another pitfall are the stones in dry beans. I do not know how pebbles find themselves in dry beans, but they do and forgetting a pit or a pebble is the bane of good chefs everywhere. Democratic Congressman Dennis Kucinich, unfortunately was on the receiving end of a olive pit in his wrap. Congressman Dennis Kucinich bought a sandwich from the Longworth House Office Building cafeteria in April 2008, and bit into it only to find an unpitted olive that cracked a tooth. This month, he sued the cafeteria for selling “dangerous” sandwiches. Unfortunately, pits happen and it happened to happen to Rep. Dennis Kucinich, Democratic Congressman from Ohio. A rogue pit found its way into sandwich wrap bought at a congressional cafeteria, which resulting the Congressman biting down on it and causing major dental damage. I guess, if you are preparing food for a room full of lawyers (or law makers), you better sure make sure you checked that you pitted all of your olives or cherries for that matter. And while you are at it, check for stones in your dry beans too. Updated: Taco Bell Law Suit dropped. The law firm Beasley Allen, based in Montgomery, Ala., said it dropped the lawsuit after Taco Bell made changes to its marketing and product disclosure. I am old enough to remember the old commercials with the slogan:”Where’s the Beef. Today , thanks to a class-action lawsuit in California, Attorneys are asking Taco Bell: Where’s the Beef? Attorneys in the suit had the “meat mixture” in question tested, which found only 35% of the product to be beef. At 35%, the meat mixture does not meet the USDA minimum requirements to be able to label something as beef. Taco Bell is being sued for false advertising and the law firm is asking them to stop saying they are selling beef (menu item). But the Company is not taking it lying down. I have not seen any official percentage of beef in Taco Bell’s beef mixture offered as a retort to the lawsuit. So what is the other 74% in Taco Bell’s Beef Mixture if it is in fact only 36% beef? I figure in this down economy, getting a 36% beef return on my investment in a Taco Bell menu item is not bad. OK. Normally I would cook my own beans and rice, but I have been so busy with school and writing for the newspaper that I did not get around to it. 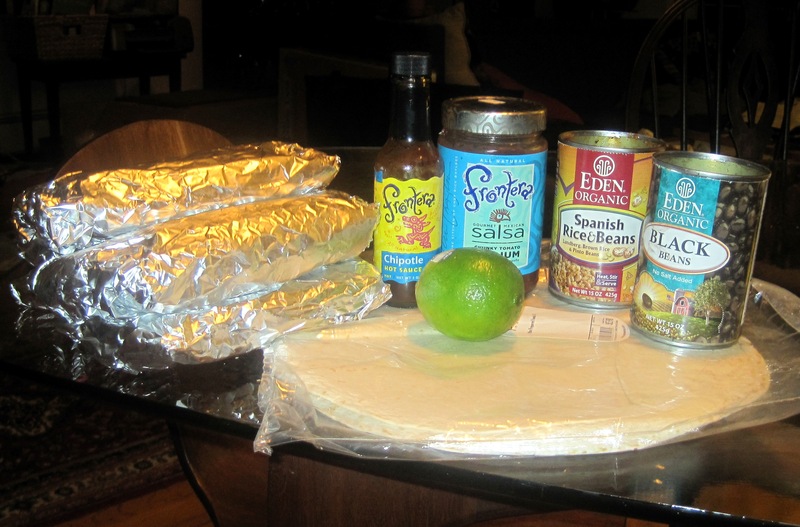 Eden has canned rice and bean, so a bought a few along with black beans and I went into a burrito production. The recipe I came up with makes 6 large burritos restaurant size and only takes about 30 minutes. I ate one for dinner, refrigerated one and froze the rest for lunch for the week. Saute the meat in a little oil till cooked with a little chili powder and set aside. Heat the rice and bean and black beans in the same pan. Squeeze in the juice of two limes, chili powder and some hot sauce. 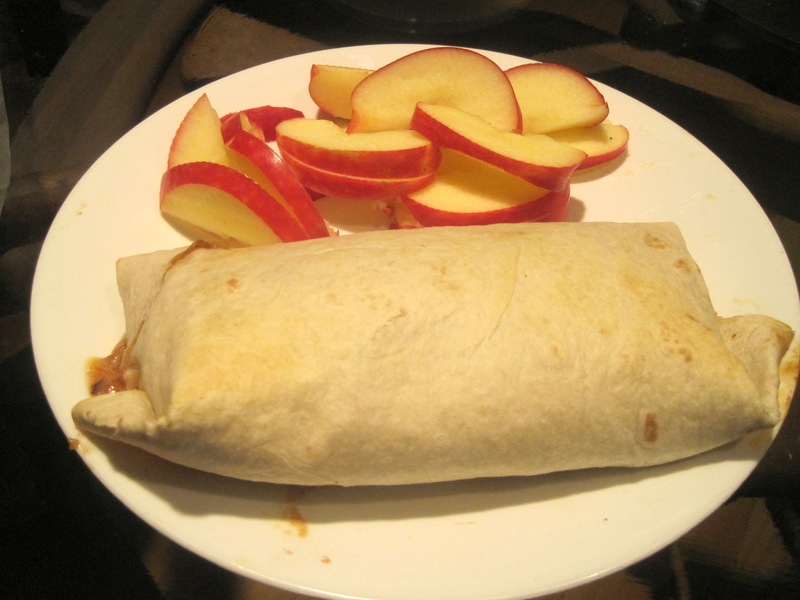 Place a burrito warp on a plate or cutting board. Place some rice and bean mixture in the center. Then add some meat, some cheese and top with salsa. Fold the sides over the filling, then fold the ends closest to you over the filling. Tuck the filling in toward you, then flip the burrito over like an envelop to close. Wrap in tin foil or plastic and repeat, if saving for later. You can eat them as is, or put them in the toaster oven and toast for a crispy outer shell. This made five burritos with meat and one beans and rice and cheese. About 2.5 million Americans are affected by celiac disease. It’s an autoimmune condition that causes damage to the small intestines when sufferers eat foods with gluten, a protein found in wheat, rye, barley and spelt. Once diagnosed, people with celiac disease must not eat any foods with gluten, which can be a challenge considering how many foods contain the protein. Rabinovitz was diagnosed with the disease in 2007. Shortly after that, she started working on her idea to start a bakery that featured gluten-free baked goods. “I have been baking ever since I was a kid,” said Rabinovitz. Her bakery, which she runs out of her home, started in May 2009. 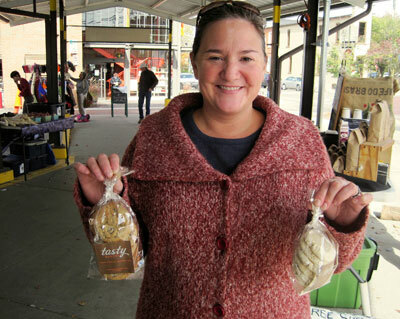 She sells her baked goods at the Ann Arbor Farmers’ Market with offerings that include brownies, cookies, muffins, scones, crackers and granola bars. She also makes cakes and pies for special orders. At the market, appreciative customers who eat gluten free inquire about her baked goods. Their eyes light up when Rabinovitz tells them that they are all free of gluten. Businesses like Rabinovitz’s Tasty Bakery can be an oasis for those on a gluten-free diet. Regulars became fans of specific items and they get upset when they are sold out. On the day she was interviewed, she sold out of brownies. But not all of her customers are gluten free. Not all of her gluten-free baking attempts work out, however. “I tried to make gluten-free donuts last year for Hanukkah, but they did not rise,” said Rabinovitz. Rabinovitz is a veteran of eating gluten free, but to the recently diagnosed, a gluten-free life takes some getting used to. Gluten-free baked goods are on display at Tasty Bakery in Ann Arbor. Mike Zinger, a Washtenaw Community College student, was in his third week trying to eat gluten free after being diagnosed. His situation is even more challenging because of where he works, Panera Bread. He also lives in an Italian home with a mom who makes his favorite meal, pasta. “It is like being an alcoholic and working as a bartender,” said Zinger referring to his job. One of the biggest challenges to eating gluten free is eating out. Zinger is in a band that tours, and he is concerned about eating gluten free on the road. It is common for people who are gluten-free to desire certain foods that they used to have before being diagnosed. Luckily, several Ann Arbor restaurants offer gluten-free items and grocery stores have started to cater to gluten-free customers by providing a growing special section. Whole Foods even offers gluten-free tours of their stores to showcase the foods they offer. Zinger and Rabinovitz are not alone with eating gluten free. Chelsea Clinton, the daughter of former President Clinton and Secretary of State Hillary Clinton, also eats a gluten-free diet. She was recently married and had a gluten-free, $11,000 wedding cake. There are challenges to eating gluten free, but artisan gluten-free bakeries like Rabinovitzs’ can make it a little easier. “You can have your (gluten-free) cake and eat it too,” said Rabinovitiz. Mix all of the ingredients together and scoop one round tablespoon per cookie on a cookie sheet. Bake for 15 minutes in a preheated 350-degree oven.